The sun is still shining in Marbella and I´m still wearing shorts (ok, with boots, but still) and yet everyone seems to be talking about the Sierra Nevada Spain ski season already! 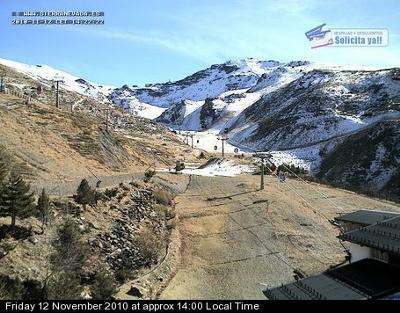 Many of the local papers and websites have announced that the slopes at the Pradollano ski resort in Sierra Nevada will open on Saturday November 27 provided that the quality and quantity of snow is adequate. What´s hitting headlines now is the new ski zone called the Sulayr Superparque de Montebajo which is geared towards snowboard and freestyle fans. The Sierra Nevada ski resort has been revamped with this park in order to attract a younger set of skiers and snowboarders enticing them with three different areas offering both natural and artificial snow, music, Wi-Fi and a whole new cool look that is different from the areas of the resort. This "superpark" has been built in an area of the resort called Loma de Dilar, which was previously cut out for cross-country skiers. It offers snowboards an extensive area with lots of challenging new obstacles such as half-pipes, S-boxes, pyramids, gaps, rails and jumps. The area is much larger than the previous one in Borreguiles (top of the ski lifts from the main village Pradollano) where everyone has plenty of room to practice tricks without running into a beginner skier or family new to skiing. What´s also great is that this area will be provided with a security and safety team of professionals who are there to help anyone who is injured. Sierra Nevada ski resort´s main village is called Pradollano, where there are several ski lifts that take skiers up to the main hub, Borreguiles, which is about 1,500 feet above Pradollano. Once you head out of the ski lift here you will find a huge area that is now designated a family and beginners´area with lots of beginner slopes. This family ski area also has two new green runs as well as a brand new carpet lift. Is there enough snow throughout the year? I wouldn´t be too worried about the quantity of snow available, even though it is located in southern Spain. The Pradollano ski resort is equipped to guarantee snow with one of Europe´s finest state-of-the-art snow making system which can produce 1,940 cubic meters of snow per hour. If you´re looking to spend Christmas or New Year´s Eve in Sierra Nevada, I highly recommend that you start booking your hotel now. The Pradollano ski resort (this is the main village) is not that big relative to other ski resorts in Europe and it is the only one in Andalusia, so it has to accommodate a LOT of people at once. 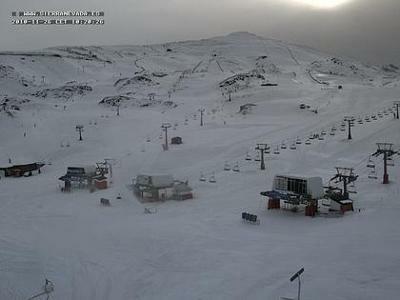 How long is ski season in Sierra Nevada? 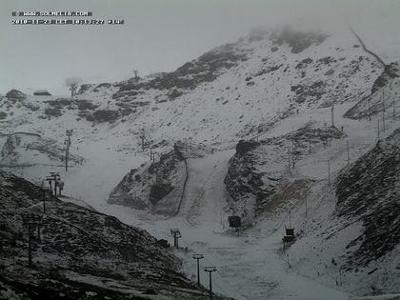 In case you´re wondering, ski season 2010 - 2011 is scheduled to end in April or May depending on weather conditions. Check out some of the Sierra Nevada websites for details on ski passes. Keep in mind that for the first time this year discounted ski passes are available if purchased in advance. I would have to confirm, but I would guess that the lifts will be open on Christmas day. We have spent the holiday Three Kings Day (January 6) on the slopes a few years ago. This holiday is even bigger and more important than Christmas day and everything was open. We rented equipment ate out in a restaurant and functioned as any other day. It would make sense that things are open since the ski season is so short here. What is open on Christmas Day? Can we expect to hire gear and purchase lift tickets. We are only in Granada for a limited time. If you want to take the hassle out of skiing, you can organize a tour with Team Xtreme, who will provide you with transportation to Sierra Nevada from Marbella, ski equipment, and instruction. We´ve been on a canyoning tour with Team Xtreme and have been very satisfied. They´re very professional and organized. See our page on Team Xtreme for more details. So far I cannot find a direct bus to Sierra Nevada from Marbella. It seems as though you will have to either take a bus from Marbella direct to Granada and then from Granada to Sierra Nevada. Or you can take a bus from Marbella to Malaga and then from Malaga directly to Sierra Nevada. Buses currently leave Marbella to Granada DIRECT at 8:30, 15:00, and 17:30. It´s a 2 hr 45 min ride and doesn´t cost very much. I remember the prices being very reasonable. There is another bus, but it´s INDIRECT leaving Marbella at 10:20am (Friday and Sunday only) and 12:35 (Monday to Sunday). Here are a couple of websites where I found some bus timetables that may help you out. Do you know if there is public transport from Marbella to Sierrah Nevada or from anywhere along the coast?